Western Blot analysis of high mobility group protein B1 expression in K-562 using Mouse anti Human high mobility group protein B1 (MCA4791Z). 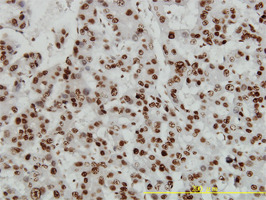 Staining of paraffin-embedded human hepatocellular carcinoma tissue with Mouse anti Human high mobility group protein B1 (MCA4791Z). 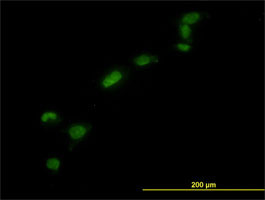 Immunofluorescence showing high mobility group protein B1 in HeLa cells using Mouse anti Human high mobility group protein B1 (MCA4791Z). Mouse anti Human High Mobility Group Protein B1 antibody, clone 1D5 recognizes human high mobility group protein B1, also known as HMGB1 or HMG-1. Human high mobility group protein B1 is a 214 amino acid ~27 kDa multifunctional redox sensitive protein acting as a DNA chaperone, immune response promotor and in the cytoplasm acts as a sensor for immunogenic nucleic acids.